photo by Linda Stansberry Prominent Bay Area activist Renee Saucedo leads a discussion in Orick detailing issues facing the local Latino community. photo by Linda Stansberry Yulisa Yanez is an honor roll student at academy of the redwoods, but fears her undocumented status may prevent her getting a college scholarship. 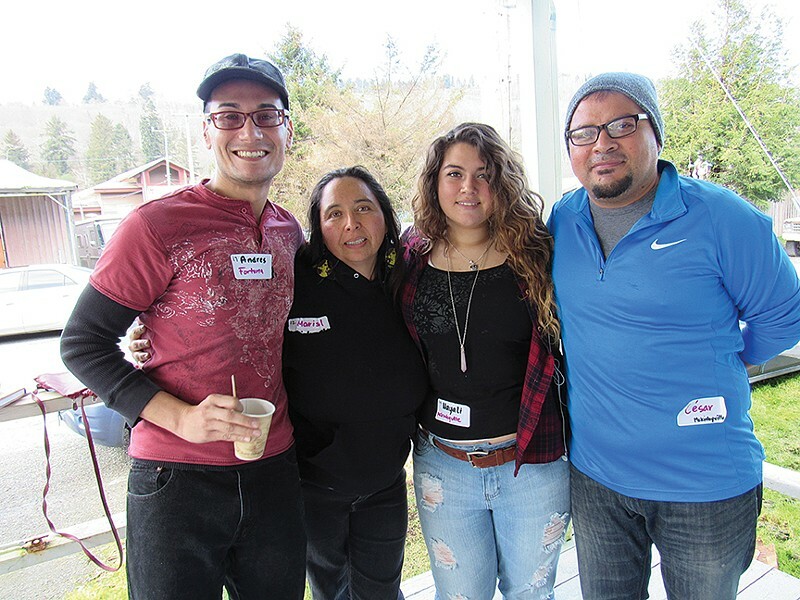 Andres Castro, Marisol Ruiz, Nayali Abarca and Cesar Abarca during a break from a True North Organizing Network event in Orick, which drew more than 200 people to discuss issues facing the local Latino community. photo by Linda Stansberry Paso a Paso staffer Jorge Matias, RIGHT, pictured here at an event in Orick, tried to cross the border near Tijuana four times unsuccessfully. Since his fifth — and successful — attempt, Matias has married, obtained citizenship, gotten a G.E.D. and become a social worker. photo by Linda Stansberry Pastor Ruben Nehemiah Rodriguez of the Pentecostal Church of Jesus Christ Ebenezer believes many community problems are rooted in the fact people don't have enough time to spend with their families. 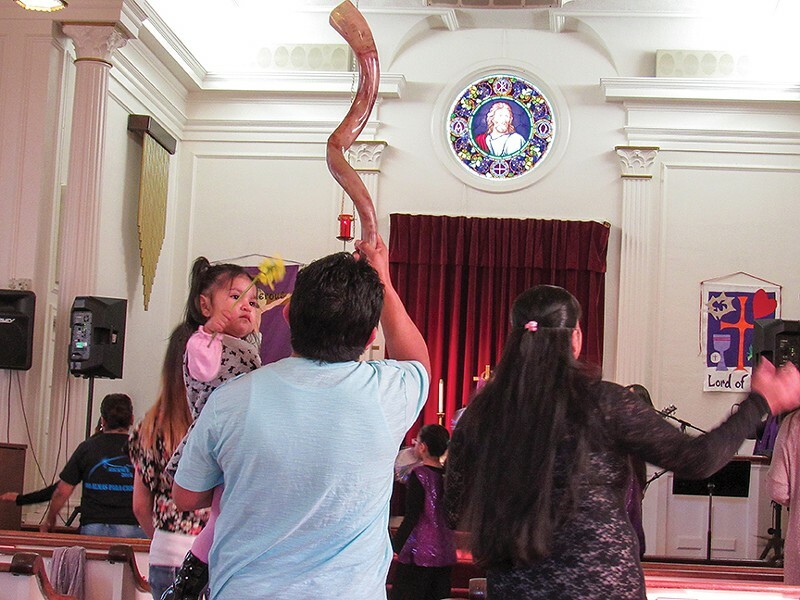 photo by Linda Stansberry A man blows a shofar with one hand as he holds his daughter in the other during a service at the Pentecostal Church of Jesus Christ Ebenezer in Eureka. 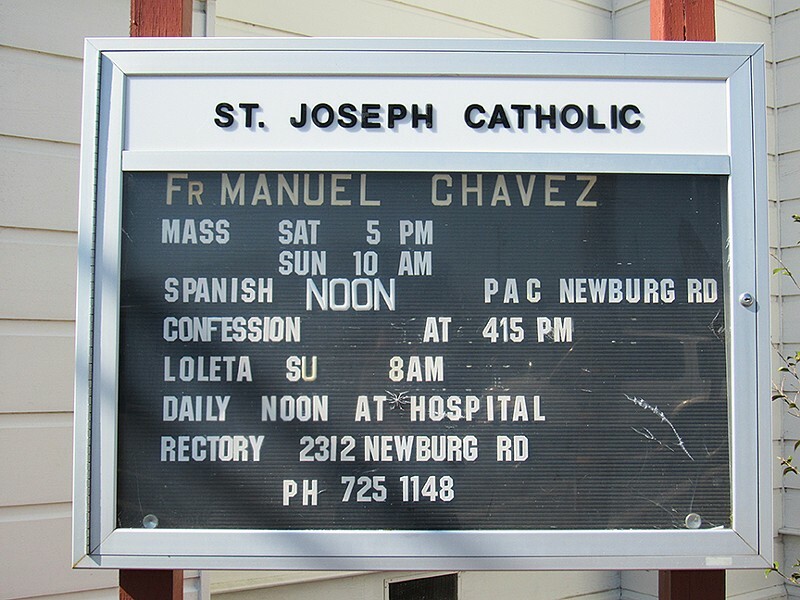 photo by Linda Stansberry A Fortuna church advertises its Spanish language Mass. photo by Linda Stansberry Joaquina Bonilla, right, pictured with Soledad Torres, has lived in Fortuna for 20 years but says she lives in fear as an undocumented resident. Several negative interactions with local police, she says, have left her and her children fearful that they will be separated by deportation. 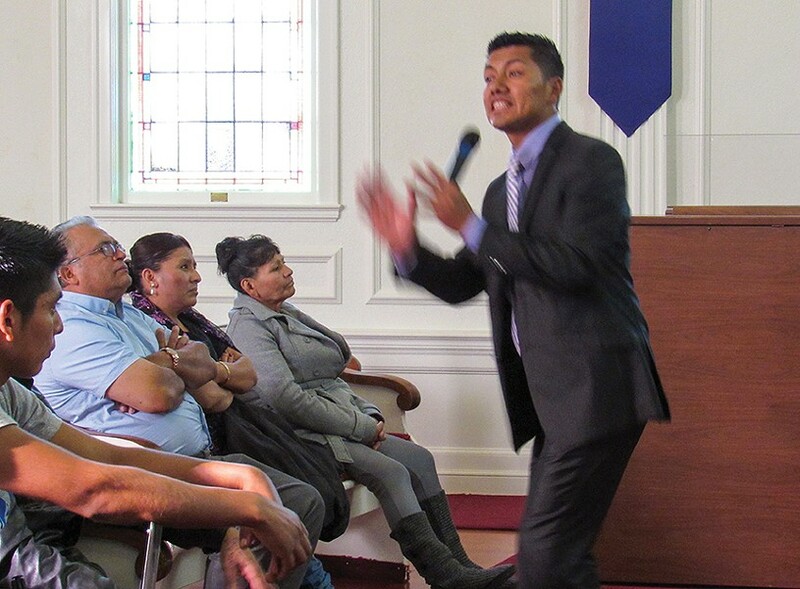 photo by Linda Stansberry at the Pentecostal Church of Jesus Christ Ebenezer in Eureka, Pastor Ruben Nehemiah Rodriguez preaches about people becoming slaves to their cell phones. Renee Saucedo is small in stature but commanding in presence, with thick, curly hair and bold, expressive eyebrows. She often raises on to her tiptoes to survey the room, one hand on her hip. "Why do we have licenses? Is it because the governor loves la raza?" The crowd laughs. Almost 30 people, mostly young mothers with children, are packed into a classroom at Jefferson Community Center. "No, it's because we organized!" Saucedo is referring to Assembly Bill 60, which grants undocumented California residents the right to apply for driver's licenses, regardless of their immigration status. The bill went into effect in January after 20 years of dedicated effort by activists, especially those in the Latino community. Saucedo is rallying Latino residents of Eureka as part of the True North network's organizing effort to see what challenges still lie ahead for the community, and what residents can do to affect political and social change. Before breaking into small groups, Saucedo takes out a guitar and leads the group in a song: "Cielito Lindo." The women's voices bump against each other at first, then join and swell in harmony. The children who had been running up and down the hall (free child care is offered at every True North event) pause to peep curiously around the doorjamb. One of the three men in attendance suddenly joins in, adding a deep, rich baritone to the medley. "Sing and don't cry, Because singing gladdens, Pretty little heaven, the hearts." A woman toward the front of the group begins to wipe slow-rolling tears from her face, first with the back of one hand, then with the back of the other. Her goal, she will tell the group later, is to be reunited with her young children who remain in Mexico. Three years ago she chose between being with them and making sure they didn't go hungry. She doesn't know when she will see them again. The True North Organizing Network, which operates under the umbrella of the Humboldt Area Foundation, is a social justice organization which — according to the mission statement on the group's website — uses "the power of relationships and a disciplined community organizing model to courageously address the most pressing problems affecting our communities." True North's structure relies on leaders to organize members of under-represented communities and facilitate dialogue before deciding on a single goal and taking action. Saucedo, the former executive director of the Northern California Coalition for Immigrant Rights and a prominent Bay Area activist, isn't interested in talking about herself. Instead she directs us toward the peer leaders, or promotores, who arose as a part of the True North process. Humboldt County is relatively homogenous in terms of ethnic diversity — 76 percent white according to the 2013 census — but Hispanic or Latino residents are the region's largest minority group at 10 percent of the population. And promotores in the True North network say their members are critically underserved. Many of the goals up for discussion during the Jefferson meeting could have come from any group of concerned citizens: better parks for children, better access to healthcare, cheaper bus fare, safer neighborhoods, better schools. Others are unique to undocumented residents: things like work abuses and the constant fear of deportation. The ultimate focus of the group is left to be determined at a later date. Before disassembling, Saucedo asks for consensus on one issue: What makes a good leader? Hands raise and adjectives are offered: empathetic, energetic, smart, a good listener. "We are the leaders of our own destiny," Saucedo concludes. "A leader does not have to speak English to have the voice of the community." "I wanted to get involved with True North after a lady spoke at my church, but I thought I would just be setting up tables or something," says Yulisa Yanez, laughing. "I was really surprised when they asked me to co-facilitate the group." Yanez tucks her long, dark hair behind one ear. We're sitting in the cafeteria at College of the Redwoods, where she is a student at the Academy of the Redwoods. 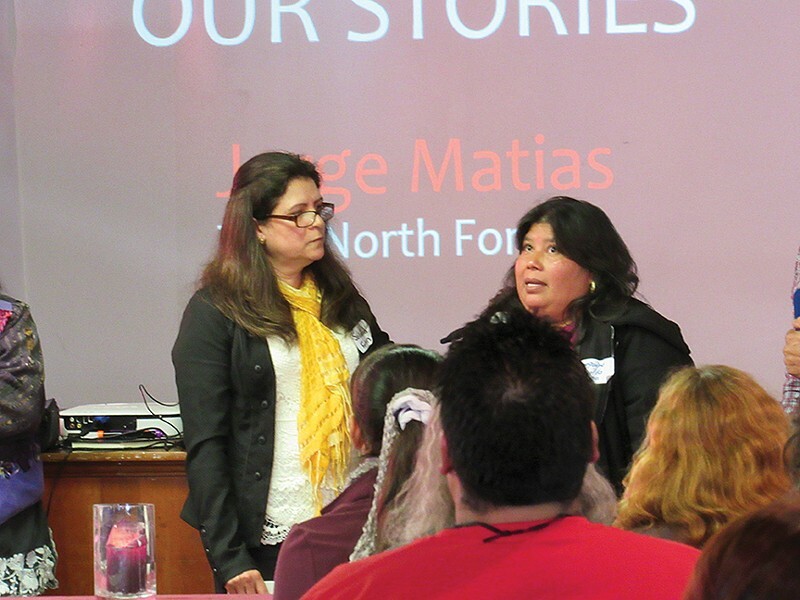 Yanez has been involved with the Fortuna chapter of True North since its inception in July 2014. It's not hard to understand why she would be asked to take a leadership position in the group. An honor roll student proficient in four musical instruments (violin, ukelele, piano, accordion), she seems destined to excel. Yanez plays music for her church band every Saturday and considers her mother — who is currently enrolled in a nursing program — one of her greatest inspirations. The two often study together. 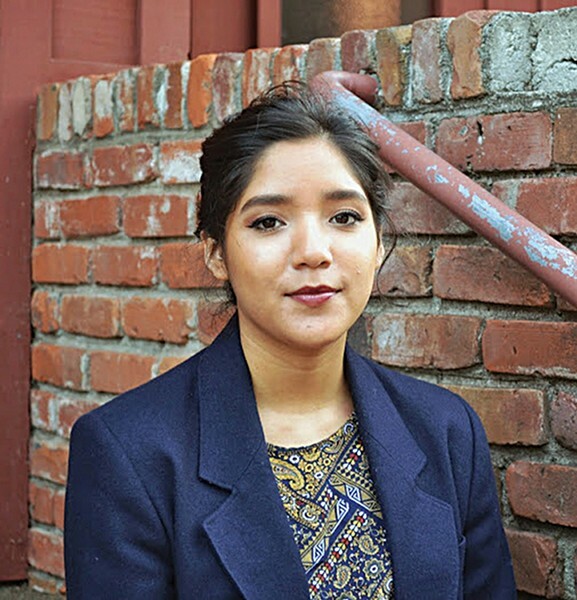 Yanez is currently finishing her senior year of high school while attending classes at College of the Redwoods, and plans to study political science at a four-year university, then attend law school. "I want a job where I can be more involved and help people," she says, adding that this is one of the reasons she was drawn to True North. "I never knew there was so much support. It's very inspiring to see all of these people working together. They really care about one another and about their families. I have a lot of admiration for them, especially being an illegal immigrant myself." Yanez's cheer and poise do not falter even as she admits that her immigration status has been a source of stress. She was 7 months old when she was brought to the United States from Mexico. "I always knew I was an undocumented immigrant and lived in fear of the police. I often heard of people being taken and deported by (U.S. Immigrations and Customs Enforcement) and that was something that scared me. I didn't want to be taken away or separated from my family." When she was fighting deportation in her sophomore year of high school, Yanez sometimes felt alienated from her peers, who were crossing major life milestones without her. "I knew that they were going to be getting their driver's licenses and cars, and going to work, and I couldn't do any of that stuff." Yanez was recently granted a two-year extension under the Deferred Action for Childhood Arrivals Act, which allows her to work and drive but does not create a path to citizenship. It remains to be seen whether she will reap the benefit of her hard work once she leaves high school. "It's kind of hard to find scholarships," she says, adding that the True North community has been an enormous support as she tries to find her way forward. "I think it's important to have someone working with you." Andres Castro has just been notified that he might be fired. Pink slips went out to all temporary contract hires in the Fortuna Elementary School District on March 15, but Castro, a school counselor at South Fortuna Elementary, would be hard to replace. With his broad, bright smile and gregarious manner, Castro is well-loved by his students. And with a background in early childhood education and fluency in Spanish, he is a valuable asset in a school where 51 percent of students identify as Hispanic or Latino and 37.5 percent speak English as a second language. "We just got a new family from Guerrero, Mexico," he says. "They're living in Carlotta and their kids were going to attend Cuddeback Elementary but since there are no Spanish-speaking faculty at Cuddeback they were sent here." What has made Fortuna — conservative, cowboy hat Fortuna — a magnet city for Latinos? Castro says families who move to Fortuna attract more family members who have entered the country, and the population increases exponentially. "It's kinship," says Castro. "There's this attitude when someone arrives of 'don't worry, we'll make space.' It's the Friendly City." Many city services and nonprofits have made efforts to accommodate the unique needs of this growing population. Chris Cooper, supervising librarian at the Fortuna Branch, initiated the translation of all library forms into Spanish in 2004. Seeing a gap between the needs of residents and what was offered at his branch, he applied for a grant through the Lois Berman Fund to expand the library's resources. In 2001 the library had 30 titles in Spanish. Today it has several hundred. Cooper has also recruited some native speakers to join the library staff, worked with the family resource center to bring ESL classes and cultural events to the city, and added a Spanish-language storytime for young children. "Our library tries to respond to community needs," says Cooper. "There are a great number of underserved populations. The onus is on the community to look beyond what the county provides." It's lunchtime at St. Joseph Hospital in Eureka, and the staff of Paso a Paso sits together at the cafeteria. A First 5 program for Spanish-speaking families, Paso a Paso has been in operation for 14 years. Although its stated goal is to provide parenting classes and help families access medical coverage, program co-coordinator Elvia Saavedra says that it has become a catch-all resource for many social issues facing the Latino community, including work abuse and domestic violence. The staff of Paso a Paso are trusted, and with that trust comes many responsibilities. "We have families living in motels," says Saavedra. "Workers who are employed without medical insurance and have no recourse when they are injured on the job, who don't qualify for worker's comp because they've been hired through contratistas (third party contractor services). They only come in when they are in so much pain they can't stand it. We advocate for the transgender community. We advocate for people who can't communicate with the police. Some in our community don't speak English or Spanish — they come from a region in Oaxaca, Mexico, where they only speak an indigenous dialect. We find translation services for them." While the majority of the program's 500-plus annual clients are women, occasionally there are times when Jorge Matias, Paso a Paso's lone male staff member, is in demand. Matias often conducts home visits and outreach with fathers struggling to assimilate into the parenting culture of their adopted country. "Corporal punishment is normal in Mexico. Your child isn't going to school? They get spanked," Matias says in Spanish, "But in Paso a Paso we teach positive parenting techniques. I tell them it is illegal to hit your child here." Matias, who has been at Paso a Paso for five years, has three children of his own. He calls his 20-year-old middle son, who is autistic, his "angel child." "He is my daily inspiration. You know, many of these children have trouble socializing, but he is going to school now, at CR, he's going to be a music teacher. We put a lot of work into helping him. Well, my wife, especially, put in the work." A concern often raised by parents at the True North gatherings is drugs in public schools. One of Matias' clients is a father whose 10-year-old son was arrested for selling marijuana at his middle school. Matias and others express frustration at stories like these, saying that while the father of this child would be appearing in court and navigating the legal system, the issues entrenched in the system would be unaddressed. Matias said that while the school system, law enforcement and other entities play a role, ultimately the responsibility for children in such cases falls to the parents. Drugs and crime are just some of the issues threatening to erode the cultural values and family structures held dear by Matias and his cohort. "I'm old school," Matias says, switching to English, "When I came to this country, I knew I had to work. I think maybe people don't have this kind of mentality anymore." Matias has lived in Fortuna for 15 years. His father and uncle originally settled in the area in 1972, working at dairies in Ferndale. The border was more porous then. Farmers and ranchers would cross into Mexico looking for laborers. Jorge's father left after two years, returning to Mexico City to raise his children. Matias says his neighborhood was a dangerous place to grow up. "Either you kill somebody, or they kill you." Matias desired an education. His first choice was to go to university, but this proved to be outside his family's financial means. Instead he applied to college, a competitive endeavor in Mexico. "One-hundred-twenty-five-thousand people applied, but they could only admit 25,000 people. I could have applied again, but I knew I would be competing against another 125,000 people and all of those who had been rejected with me. I learned on a Tuesday that I would not be admitted, and on Friday I went to Tijuana." It took Matias five attempts to cross the border at Tijuana. Once across he headed north to where his uncle lived. He went to work for a dairy in Ferndale, rising before dawn to milk cows and then attend College of the Redwoods to get his G.E.D. That was 1989. He has since married, obtained his citizenship, fathered three children and begun work as a social worker for Paso a Paso. "I've discovered it's my nature to help," he says, adding that he doesn't share the concerns of others about police abuse. "I've been given so much in this country; I've never felt abused." "You are strong, God, you are generous." The choir is singing in Spanish, accompanied by a well-dressed young man on keyboard who grins and occasionally closes his eyes in ecstatic contemplation. Women, their hair covered with sparkling scarves, sway in the pews, their hands raised in worship. Toward the front of the church, a father holds his toddler daughter in one arm and raises a shofar in the other, blowing a long, atonal punctuation to the music. Other congregrants whistle and shout. The band shifts to a faster tune. In front of the stage a troupe of young girls in spangly purple vests dance and twirl in unison, banging tambourines. From a side door a middle-aged man in pressed black slacks and a white button-down shirt appears holding a long golden sword. It's Sunday worship at the Pentecostal Church of Jesus Christ Ebenezer in Eureka, and in a few moments Pastor Ruben Nehemiah Rodriguez will begin one of his show-stopping sermons. First, however, he ushers us into the church cafeteria, where worshippers dine together after service. We are joined by his wife and fellow pastor Adriana Rodriguez. The young couple is well-dressed and appears very much in love. When one speaks, the other looks on attentively, adding input and support. They are recent arrivals in Humboldt County, sent by their church to live and work in the area. Rodriguez says that much of the work he does with his congregation revolves around supporting families. "It says this in the Bible, that families are meant to be together. Our life is meant to be together and to serve God. Unfortunately, many of the people in our community are working, and they don't have the time to pursue this goal." Rodriguez attributes many problems within his community to a dissolution in family structure; working parents don't have the necessary time to spend with their children and teach them about God. He finds the young age at which many people in Humboldt County begin smoking marijuana especially shocking. He often hears complaints from parents about the availability of drugs in local schools. "There is too much liberty in the culture now," he says. "Young people are searching for someone to respect, and they don't have those role models. For many of the young people I work with, they see me as a father, and Adriana as their mother." The pastor says that a lack of respect for authority is reinforced by the interactions many in his community have had with the police in Humboldt County. In Mexico, he says, it is common for the police to extort people. It's unpleasant, but if you're apprehended by an officer there, you know what to expect. For many in his community who are undocumented, a routine traffic stop in the United States is the source of incredible stress. Impound fees that can top $1,000, jail time, tickets, navigating a foreign court system: All of these issues contribute to a culture of fear. Back in the worship hall, people have begun crying. Several women kneel in the aisle, their sparkling scarves pulled around their faces, speaking in rapid Spanish. A man sobs aloud his lamentation to God. Pastor Rodriguez strides to the stage and begins to preach. His sermon is accompanied by an English translator. "We have to be brave warriors and soldiers of God," he says, suddenly lifting aloft the sword he'd carried in earlier. He parries and thrusts to punctuate his words. He finishes his metaphor by handing the sword by its hilt to a man in the front pew with a small joke about safety. Polite laughter breaks out, dissolving the tension of the sobs and the speech. But the pastor raises a finger. His point is not finished. "In the United States we have the potential to grow strong. We have to fight for our families, our lives, the city we are in, to show that we are the light in the darkness." 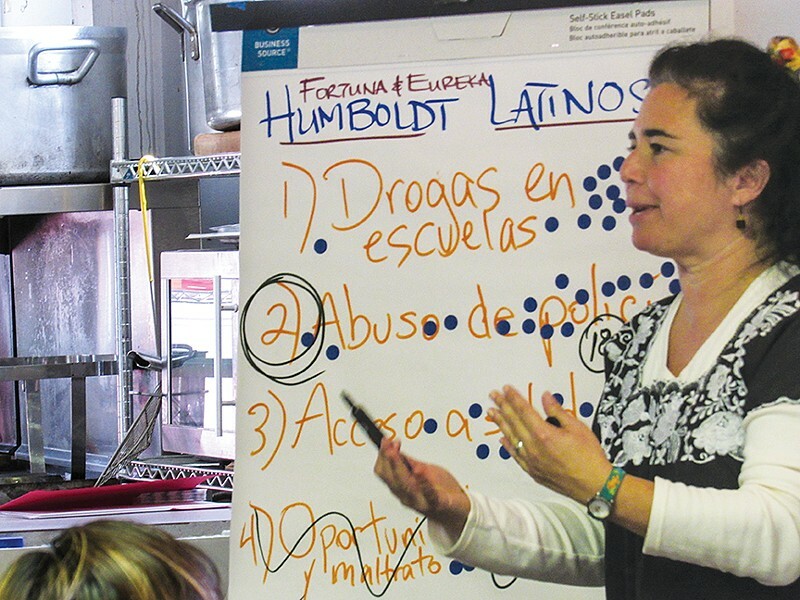 A recurring theme in conversations with leaders in Humboldt's Latino community is disconnection. Between family and faith. Between children and parents. Between inherited culture and adopted culture. Between what is available, and what is necessary. Between what is just, and what is legal. One group has been quietly working to bridge these gaps for the last 15 years. 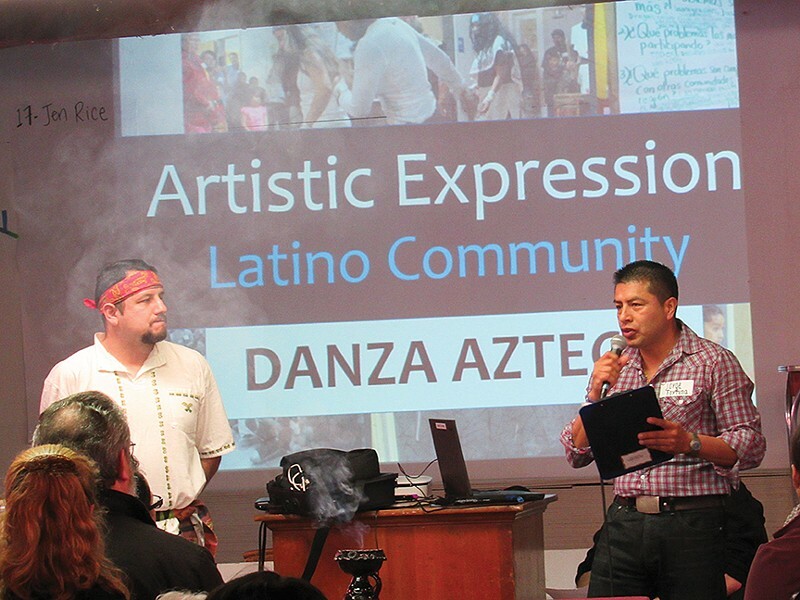 The Latino Community Providers' Network (LatinoNet) is a grassroots organization turned incorporated nonprofit. It holds monthly meetings to discuss issues facing the Latino community and hosts several annual events, including a large health fair, Festejando Nuestra Salud. Its board is seeded with familiar names: Renee Saucedo, Andres Castro, Jorge Matias. Castro says the organization was instrumental in helping him find a sense of community when he first relocated to Humboldt County. Leon Villagomez, a former LatinoNet board member, echoes Castro's words. A photographer originally from Guadalajara, Villagomez relocated to the area in 2011 and found himself searching for a connection to his culture. "I wanted to do something, I wanted to be involved with my community, so I literally typed Humboldt and Latino into a search engine. It has been an excellent experience." LatinoNet helps connect community members with existing public resources related to health care, immigration, employment and education. But how helpful these resources are is a source of debate. Matias, for example, says that when his clients are mandated to take domestic violence classes, the courses are entirely in English. Gina Walker, a former mental health clinician at Children and Family Services who now works as an interpreter for the county, says the obstacle isn't necessarily a lack of resources, but a lack of communication. Any service that uses money from the state, city or government needs to be accessible in the client's primary language, but do the clients know to ask? "A lot of times programs get set up but making them accessible is an afterthought," she says. "Sometimes people don't know how to ask for a translator, don't know that it's their right to ask. Maybe it should say on all flyers for services that interpretation is available." Walker adds that teleconferencing translation services are closing the gap in some cases, but the technology is far from perfect. "It gets tricky — how do you use a language line in family therapy?" she asks. Fortuna City Manager Regan Candelario says that his staff is "committed to serving the entire community, regardless of what language they speak." Candelario adds that he has yet to encounter a situation during his tenure with the city where Spanish was necessary, but True North leaders in the region contest that language barriers are a persistent issue, and say undocumented residents are unlikely to bring complaints through official channels. As with Paso a Paso, much of the burden of advocating for Spanish-speaking residents falls to non-government organizations with an established community rapport. As an example, Andres Castro points to a recent incident in which an Americorps worker at the family resource center intervened for a Spanish-speaking family facing eviction due to a miscommunication over a broken refrigerator. The worker went to the home and fixed the refrigerator. "A system cannot fail those it was never meant to protect," says Fernando Paz, a leader in the True North movement and a graduate student at Humboldt State University who is writing his thesis on immigration in Humboldt County. He says the Latino community is both insular and "invisible," largely out of necessity. Paz says the challenges facing his community, particularly migrant workers, came into sharp relief when Sun Valley Floral Farms was raided by U.S. Immigration and Customs Enforcement in 2008. 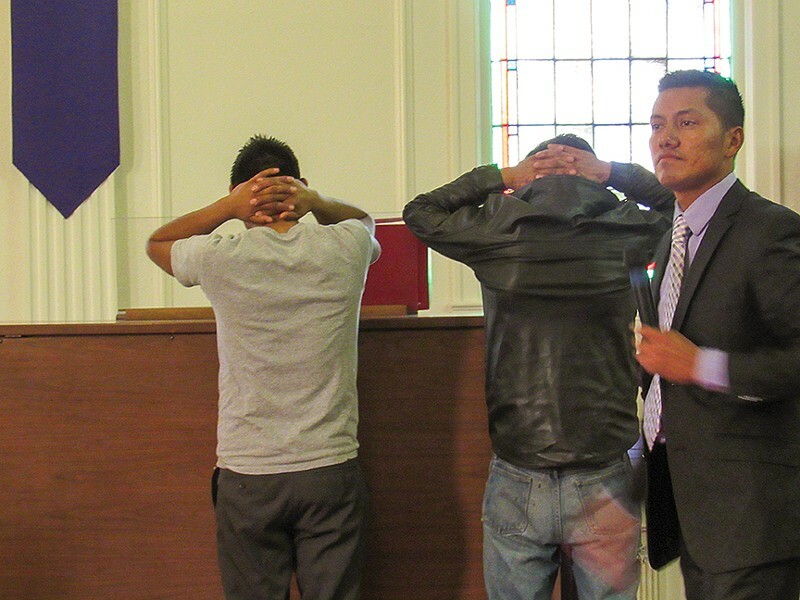 He and several other students collaborated with migrant workers to form People Affected by the Raids in Arcata (PARA). Bilingual legal advocacy is nonexistent in the region, says Paz, who is working to bring legal workshops and temporary assistance to the area to help those struggling with deportation orders, workplace discrimination and other issues. Paz has also been involved with LatinoNet — as well as its grassroots offshoot Promotores — since its inception, but the organization struggles with a persistent question: How can you connect people with a resource if the resource doesn't yet exist? On a Saturday in late February, 240 people from faith groups, nonprofits, tribes and community organizations fill Orick's community hall for the True North Organizing Network's Regional Assembly. The event marks the end of the network's first stage, called the "Season of Listening." Each group presents its findings from several months of community meetings in preparation to develop concrete goals and begin the next phase, a "Season of Research." The ultimate goal of the network, to "mobilize 1 percent of the population in Humboldt, Del Norte and Tribal Lands," may sound modest, but the structure, vision and inclusiveness of the network as exemplified by the Orick gathering may give it a staying power where other movements have fizzled. Paz, who helped open the day with a traditional dance, says the gathering marks a "critical point" for undocumented members of his community, who, since the raid in Arcata, have "lived in invisibility and under a climate of fear." Jorge Matias repeats the story of the boy who was arrested for selling marijuana. "As a father, I cannot imagine what this experience is like," he says. Pastor Rodriguez stands and speaks with his customary flair about the importance of creating economic opportunities and preserving families. As the timer at the back of the hall repeatedly flashes a sign saying that his time is up, he delivers a passionate diatribe about police abuse: "We should respect the authorities, but they must remember they are here to protect us." Renee Saucedo gathers True North leaders into a focus group and asks them to choose a common goal for the "Season of Research." Health care, drugs in schools and immigration reform are popular choices, but in the end the majority votes to prioritize the issue of police abuse. The goal will become part of True North's regional platform. Joaquina Bonilla, a mother of five, takes the microphone alongside her friend and fellow True North promotore, Soledad Torres. Torres uses the word luck when she describes her American story. She had papers when she came to the United States. She has done well. Many others in her community have not been as lucky. "Problems with immigration and police are very stressful for the children," Torres says. "When the police are talking to their parents the children are trembling. The majority of families have very few resources, they cannot return to their country. We feel like our children need to be able to sleep in peace." Bonilla, a Fortuna resident for 20 years, lives with her husband and children in a small trailer behind an abandoned Mexican restaurant off Fortuna Boulevard. The trailer park, which some locals call "Little Mexico," was one of several areas visited by immigration officials after the Sun Valley raids. It is cramped and the makeshift byway that loops between the decrepit trailers is pocked with puddles. Dogs, tied to railings, bark at each passing car. On the dirty window of one trailer is a sign, "No Drugs Inside." Bonilla says that she shares a sense of community with the other families who live in the park, although there are problems with "drug addicts" and she doesn't let her daughter walk alone there after nightfall. Bonilla is more scared of what waits outside. "Several years ago my husband got sick," she tells the crowd in Orick. "He got diabetes and he lost his vision. He could not work. He lost his insurance. He could not drive. We decided it was not possible for us to sit and wait for God's will." Bonilla alleges that the officer was verbally abusive and threatening. "When I got my first ticket I thought I was going to jail. The officer said he could arrest me because I didn't have United States identification." In another incident she says that when she asked why she was being stopped the officer "screamed at her," told her to "shut up" and said that she "didn't have the right to talk." In a phone interview, Fortuna Police Chief Bill Dobberstein says he has no record of complaints matching Bonilla's. He denies any racial component to the traffic stops, saying that "we're not profiling any ethnic group. "If you're driving unlicensed or driving on a suspended license the vehicle code has provisions that we impound the vehicle," he says. Dobberstein adds that his department has responded to the growing needs of the Spanish-speaking population by adding a bilingual officer and a three-person volunteer translation team. "If we have someone who has no English skills, we do everything we can to provide services." The cultural divide in the Friendly City may be softening, and legislation such as A.B. 60 may make experiences such as Bonilla's a thing of the past, but gaps still exist. Between culture and policy. Between needs and resources. Between agents of change and agents of power. The biggest gap may be between Latino residents like Bonilla and those in positions of authority. When her husband sent for her and her children 20 years ago, she was struck by the calm and quiet of Fortuna. "Una puebla tranquila," she says, her voice trembling. "A calm village. But today I don't feel safe even walking on the street. I don't want to leave my home." The residual stress of her past interactions with law enforcement has affected her children as well. They, too, are nervous. They do not trust police. They are afraid of their family being separated by deportation. On stage at True North, in front of a hushed audience, she pauses to draw a deep breath and wipe tears from her cheeks. She glances at Soledad Torres, who gives a subtle nod of encouragement. "Now, though, I feel the need to move forward." Editor's Note: This story was updated from a previous version that contained an inaccurate statistic regarding the student population at South Fortuna Elementary School.